The contract issues are still a cause of much concern amongst the profession and the RCEM submitted proposals to the DDRB, NHS Employers and the BMA. Although the outcome was not of our choosing it is important to recognize that because of our submission re the onerous nature of EM shift patterns the new contract will actually lead to better weekend rotas for our trainees. Salaries will also be as good or better. The same cannot be said for many other specialties, hence the ongoing resentment of the new contract. Data from the Emergency Medicine Trainees Association analyzing rota and salary changes demonstrate this. 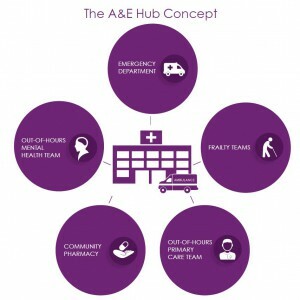 I would also like to highlight the launch of our A&E hub model. We have worked hard to forge alliances and common purpose and now have all the key professional organisations endorsement of the concept. This has been a key part of our STEP campaign and one which potentially offers the greatest benefit to patients and EM staff alike. It is not a complex model its power lies in its simplicity. No mass education programmes (repeatedly shown to fail), no signposting away from where patients want to go (doomed), no expectation that EM can be anything and everything (absurd) but proper recognition of the key role others have to play in an urgent and emergency care system that is fit for purpose in the UK in the 21st century. We know that many hospitals do not provide these co-located services currently. If they did we wouldn’t need to promote this model. The college will make the case for such a structure wherever and whenever it can at a national level and we would hope all members and fellows will similarly argue the case locally. Wherever reconfiguration of services is planned the following issues must be considered and addressed. Any proposals should be predicated on a proper risk assessment of these key issues which should be published for consultation. Relocating services has a disproportionate effect on the very young, the very old, patients with mental health issues, those with chronic illness or reduced mobility. Relocation also has a greater impact on poorer socioeconomic groups through difficulties with transport. The likelihood of transportation difficulties will be higher in rural areas. Increased travel times are associated with worse outcomes for some patient groups with time critical illness [i]. The increased demands on ambulance services brought about by longer transport times are seldom properly modelled. Similarly, repatriation issues are often ignored. Patients in hospitals at a distance from their homes may be harder to discharge and so increase hospital occupancy rates. Moving resource / capacity issues does not solve them. The necessary increased capital and revenue expenditures at the receiving site(s) are seldom properly modelled. The King’s Fund have demonstrated that the cost efficiencies associated with such reconfigurations are largely illusory [ii]. There is an inherent unintended consequence of rendering other services at the same site non-viable; by limiting the case-mix and case-load, reconfiguration exacerbates recruitment and retention issues in non-EM services such that a self-fulfilling, non-viability scenario is created. Emergency departments in the UK are substantially larger than international comparators – even small UK departments are relatively large in relation to European, American and Australasian departments. Each ED and hospital should be staffed and resourced to a level sufficient to manage predictable peaks in workload, 24 hours a day, seven days a week. All hospitals should have clinical and managerial teams on site able to deal with predictable events that may pose a clinical risk to individual or multiple patients, including increased attendance numbers, crowding due to acute bed shortages (exit block) or staffing issues. Consultants are ‘on call’ to deliver expertise in clinical cases beyond the experience / skill level of resident clinicians. This enables cost effective delivery of senior clinical expertise. By definition therefore, tasks that do not require senior clinical expertise e.g. acting-down to cover staff absence, are not ‘on call’ responsibilities and must be addressed via other mechanisms. Where capacity deficits have created queues, these too should be addressed through standard operating procedures that mobilise other clinicians within the hospital or redirect appropriate patients to medical, surgical or paediatric assessment units. Good risk management must maximise resources available to deal with such problems. Concentrating multiple risks in a single area is very poor practice. If exit block is considered to be such a problem that the ED is rendered unsafe, then the duty management team including the executive on call and the relevant medical and surgical consultants must attend the hospital. Exit block is a problem of ‘downstream’ capacity – an ED consultant can only mitigate the effects in the ED whilst colleagues seek solutions within the hospital and community. UK employment law requires all employees to have 11 hours of uninterrupted rest in every 24-hour period. In the NHS this is to ensure the health and safety of patients as well as that of employees. Compensatory rest arrangements (taken when the above rest periods are interrupted) are very disruptive to ED rotas and as such the need to trigger them should be minimised. It is particularly unsafe to require any employee with overnight on call responsibilities to work frequently or substantially in excess of their rostered shift times. This is a significant issue for consultants working late evening shifts and then on-call overnight. No employee should be required to extend their shop-floor shift beyond 12 hrs. Fatigue is not a defence when faced with litigation or regulatory sanction. The introduction of the four-hour standard in 2004 transformed Emergency Departments for the better, reducing the unacceptable trolley waits and overcrowding that was endemic at the time, and leading to significant focus on emergency departments with some initial investment. Continued focus on the standard over the years has been valuable in highlighting areas of weakness across the system and stimulating positive change. Achieving the standard has become more challenging in the last few years and RCEM has highlighted the key causal factors, particularly exit block. The Four Hour Standard is widely regarded as an important barometer of the capacity of the whole system to cope with demand [iii]. The metric is a standard not a target – it is a means to an end, not an end in itself. Pressure to report good performance figures can risk muddling clinical priorities with ‘target’ performance, a case of attending to the ‘letter’ rather than the ‘spirit’of the standard. Such consequences risk undermining the very purpose of the four-hour standard. The first duty of all Physicians is the care of patients. Time and resources should be allocated primarily on the basis of clinical need. The determination of need must include recognition that overcrowding is in itself a cause of increased morbidity and mortality for patients. To this end there are two key leadership roles within each shop-floor ED team. The first is clinical leadership which includes allocation of manpower, to best match clinical priorities, whilst the second is departmental oversight which addresses issues of crowding and flow. These roles may be undertaken by the same person or separated in accordance with local practice, case-mix and case volumes. On occasions tensions will arise between the priorities associated with these roles. In such circumstances clinical priorities are paramount. [i] The relationship between distance to hospital and patient mortality in emergencies: an observational study Emerg Med J. 2007 Sep; 24(9): 665–668. This entry was posted in President's Blog and tagged Cliff Mann. Bookmark the permalink.